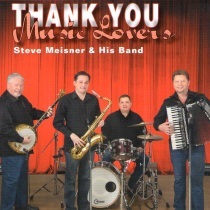 Steve Meisner presents his latest CD entitled "Thank You Music Lovers". This CD was recorded Live-In-Person and showcases the talents of Steve Meisner, Don Hunjadi, Denny Anderson, and Rick Hartmann. 21 Classic Meisner Polkas and Waltzes. Don't Pass this outstanding CD today! We at PolkaConnection.com recommend this CD.